The VI Corps plan for the attack in the direction of Colli Laziali on 30 January called for a two-pronged advance, with the main blow to be delivered on the left. On the right the 3d Division, reinforced by the 504th Parachute Infantry Regiment and Ranger Force, was to attack at dawn to cut Highway No. 7 at Cisterna. The capture of this key road junction would dislocate the German left flank and pave the way for a 3d Division thrust up Highway No. 7 to assault Colli Laziali from the east. On the left, the British 1 Division and the 1st Armored Division were to follow the Albano road axis, the best and most direct route inland. The 1 Division was to drive up the road toward the high ground above Albano and Genzano on the southwest slope of Colli Laziali, while the 1st Armored Division swung wide around the left of the 1 Division to come in on Colli Laziali from the west. (Map No. 21.) A preliminary artillery preparation was not considered necessary, but extensive supporting fires, a smoke screen laid by air at daylight, and naval gunfire support were planned. The air force prepared an elaborate air program, including special air cover for the advance of armor. Once VI Corps attained the commanding heights of Colli Laziali it would be astride vital enemy communications routes and so threaten to cut off the German forces in the south. The need for careful control and coordination of the advance was recognized by General Lucas, for the missions of the right and of the left were initially divergent in direction; should VI Corps be overextended, the enemy might take the opportunity of splitting the Allied forces. In order to concentrate on a narrower front for the offensive, the 1 and 3d Divisions regrouped on 28-29 January. These divisions were relieved along the beachhead flanks by the 45th Division so that they could employ their full strength in the advance. Elements of the 45th Division and Corps engineers took over the positions of the 2 Brigade along the Moletta River and of the 504th Parachute Infantry on the opposite flank along the Mussolini Canal. At the same time Ranger Force and the 3d Battalion, 7th Infantry, were relieved by the 1 Reconnaissance Regiment in the quiet central beachhead sector. As VI Corps prepared to launch its offensive toward Cisterna and Campoleone on 30 January, the German forces were being regrouped for a major counteroffensive. Thirty infantry battalions, supported by armor and artillery, were being organized into combat groups for this offensive, and six more infantry battalions were to be held in reserve. The German main line of resistance was established in front of Cisterna and Campoleone, and forward positions were strongly held. Fourteenth Army was completing its preparations for the execution of its main mission, the annihilation of the beachhead. at Civitavecchia, north of the Tiber. The Germans drew some troops from the Anzio area to meet this threat, and on 31 January ordered a thorough demolition of the harbor installations at Civitavecchia. On 2 February, headquarters of Army Group C declared that such an invasion was probable; some additional forces were diverted to the Civitavecchia area. 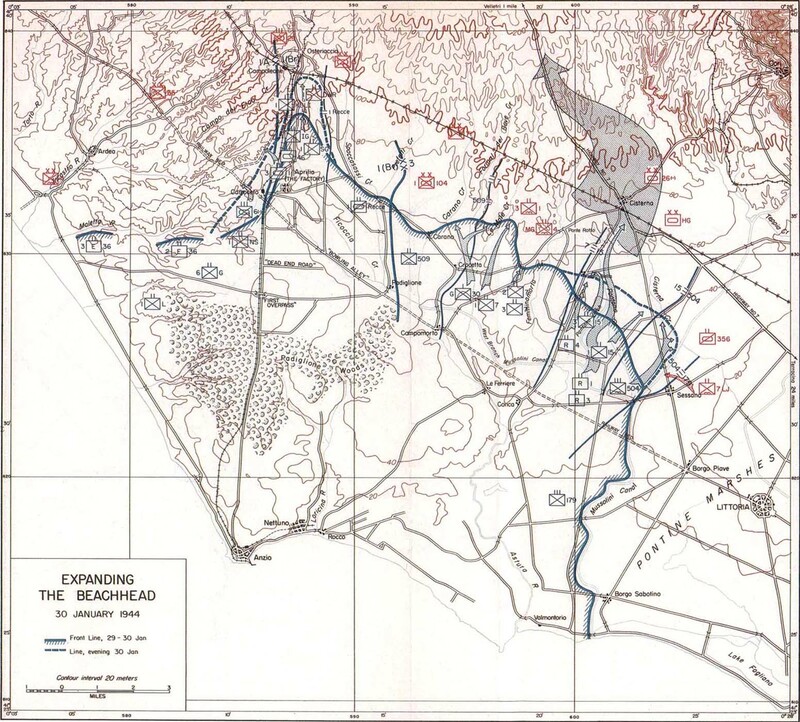 The effect of these diversions was to weaken somewhat the German defense forces around Anzio. On 30 January the 3d Division launched its drive to cut Highway No. 7 at Cisterna. (Map No. 6.) To spearhead the attack, General Truscott picked Col. William O. Darby's Rangers, veterans of Tunisia, Sicily, and Salerno. The 1st and 3d Ranger Battalions were to jump off one hour before the main attack and infiltrate under cover of darkness four miles across the fields to seize Cisterna by surprise and hold it until the main attack came up. The 4th Rangers and the 3d Battalion, 15th Infantry, were to follow an hour later up the Conca-Cisterna road. Patrol reports and a careful reconnaissance of approach routes indicated that the enemy had not yet been able to consolidate his defenses in front of Cisterna; Colonel Darby believed his men could sift through. Then at H Hour, 0200, the 7th and 15th infantry would launch the main attack. On the left, the 7th infantry was to pass through the 30th infantry and drive northeast to get astride Highway No. 7 above Cisterna, while the 15th Infantry would thrust north behind the Rangers to cut Highway No. 7 below the town. At the same time the 504th Parachute Infantry was to make a diversionary attack along the Mussolini Canal to protect the division's right flank. Men of the 1st and 3d Rangers, each with two bandoleers of ammunition slung over his shoulders and with pockets stuffed with grenades, slipped across the west branch of the Mussolini Canal at 0130 on their mission to Cisterna. In column of battalions they crept silently forward along the narrow Pantano ditch, which runs northwest across the fields to the right of the Conca-Cisterna road, Concealed beneath a moonless cloudy sky, the long snake-like column moved past numerous German positions which they could see and hear on all sides. Several times Rangers hugged the sides of the ditch as German sentries walked by on its bank. By dawn the head of the leading battalion bad come out of the ditch where it crossed the road and was within 800 yards of Cisterna. The 3d followed directly behind, the tail of the column just clearing the road running east from Isola Bella. When dawn revealed the head of the column moving down the road to Cisterna, a strong German force led by three self-propelled guns suddenly opened fire. The Rangers deployed quickly and knocked out the three guns. But as the light improved, German machine guns, mortars, and snipers, concealed in houses and haystacks or dug in all around them, trapped the Rangers in a hail of fire. Caught without cover in the open treeless fields, and with their chance for surprise completely lost, the Rangers scrambled for the ditches and houses, firing back at a hidden enemy. The Germans, anticipating a renewal of the attack on Cisterna, had brought in veteran troops the night before to stiffen the defense. Evidently the enemy had also detected the Rangers' approach through their lines and had had time to prepare an ambush. The Rangers fought desperately all through the morning against intrenched Germans all about them, At 0730 the 1st Battalion broke radio silence to report the situation in its struggle to get a foothold in Cisterna. An hour later a handful of Rangers had inched forward to take a few buildings near the railroad station at the edge of the town, but most of the men were still pinned down in the open fields. of resistance and pushed to within a mile of Isola Bella before dawn broke. As soon as the Germans could locate the attackers accurately, they kept the battalion under well-aimed fire in the open fields. Stopped in their first effort to relieve the trapped battalions, the 4th Rangers attempted a breakthrough with two tank destroyers and two halftracks, but two of the vehicles ran afoul of a mine field below Isola Bella. A second attempt also failed. All day the Germans held the 4th Rangers, who suffered heavy casualties in exchanging fire with an enemy only 200 yards away. and split them into small groups. Lacking antitank guns or heavy weapons, the Rangers fought back with bazookas and sticky grenades. One enemy tank was quickly set aflame. As a second tank rumbled down on a squad commanded by Sgt. Thomas B. Fergen, he hit it with a sticky grenade. One of his men blasted it with a bazooka and another finished the tank off by climbing up on it and dropping a grenade down the turret. As the tanks closed in, the shattered companies attempted to withdraw. It was too late. The Germans had surrounded them and they were unable to break through. As a last resort the few remaining officers ordered the troops to scatter through the fields and escape. At 1230, 1st Sgt. Robert E. Ehalt of the 3d Battalion sent a final message from the battalion command post. Only ten men were left around him, he was out of contact with all the companies, and he was destroying his radio as the tanks approached. Of 767 men in the Ranger attack only six escaped. Most of the men were captured by the Germans. A platoon of forty-three men of the 3d Reconnaissance Troop, which had followed the road behind the Rangers to outpost their line, also was trapped. The men tried to escape down the road in their jeeps but piled up on a German road block. Only one man got back. The American troops that advanced toward Cisterna on the morning of 30 January ran into a heavy concentration of German forces-elements of the Hermann Goering Panzer Division and supporting units-instead of the thinly held outpost positions which they expected. The German main line of resistance was in front of Cisterna, not behind it. Thus the Germans were able to destroy or capture the advanced elements that approached Cisterna, and to slow the American drive all along the front. When the 4th Rangers were stopped along the road below Isola Bella, the 3d Battalion, 15th Infantry, which was to push up behind them, was unable to launch its planned attack. On General Truscott's order, Lt. Col. Ashton H. Manhart, commander of the 15th Infantry, directed the 3d Battalion to swing off the road to the east and follow the route of the 1st and 3d Rangers, in an effort to reinforce them. After the Rangers surrendered, this battalion was ordered to turn toward Isola Bella and attack it from the right rear. Under cover of a heavy concentration of smoke and shells laid down on the village, the battalion found a gap in the enemy defenses and filtered across the soggy fields. Behind their tanks and tank destroyers they drove in on the battered, rubble-filled cluster of buildings, firing at point-blank range to clear each house of its defenders. By noon they had overcome all organized resistance, although they were kept busy all afternoon hunting down snipers and small groups of Germans who infiltrated through the lines. Too late to save the 1st and 3d Rangers, Maj. Frederick W. Boye, Jr., swung his 3d Battalion south from Isola Bella to clear out enemy pockets holding up the 4th Rangers along the road. Meanwhile, the 1st Battalion, 15th Infantry, drove up the parallel road about two miles to the right of the 3d Battalion to clear the regiment's right flank. Against strong opposition the battalion pushed forward a mile and a half to reach its objective. Tanks of Company B, 751st Tank Battalion, spearheading the infantry's advance, knocked out a Mark IV tank, overran three 75-mm. antitank guns, and rounded up remnants of two shattered companies of the Hermann Goering Panzer Division. the ravine formed by Cisterna Creek, because the Germans had blown the bridges, making it impossible to put supporting armor across the stream gully. In the afternoon, the newly arrived 7th Luftwaffe Jaeger Battalion attacked across the main canal, striking the paratroopers in the rear. This enemy shock battalion was made up of hardened disciplinary offenders of the German Air Force who had chosen combat service and a clean slate to military prison. The thrust was stopped by the 69th Armored Field Artillery Battalion in a hot hour of rapid firing. and officers, were hit. Capt. William P. Athas of the heavy weapons company hastily set up four machine guns, and under their protecting fire the riflemen deployed and drove the Germans from the hill to the right rear. During the day, 246 men of the scattered battalion filtered through to rally on this knoll, Maj. Frank Sinsel was sent forward to take command of the battalion and, after daylight, tanks managed to negotiate the ditches and came up in support. All day the 1st Battalion, too weak to attack, held its ground under the battering of enemy artillery and mortar fire. Reinforcements were sent up through the ditches that night, but the enemy, with guns sited accurately on the ditches, subjected the troops moving up to heavy shell fire. The 2d Battalion attack up the road toward Cisterna was also delayed. Its tanks were unable to move up through the smoke and artillery fire laid down by supporting units. When the troops finally crossed the line of departure they were thrown back almost immediately by a unit of the 1st Parachute Division, which had moved in the night before and dug in around the road junction south of Ponte Rotto. To renew the attack that afternoon, Colonel Sherman added his reserve 3d Battalion. He ordered Maj. William B. Rosson, the battalion commander, to clean up the road junction from the south and go on to the high ground overlooking Ponte Rotto. The Sherman tanks and M-10 tank destroyers operating with the battalion rumbled up over the gravel road, systematically demolishing each German-held farmhouse and haystack barring the way. Behind the screen of armor and intensive artillery and mortar concentrations, the infantry cleared the road junction from the south and pushed on to seize their objective, the knoll above Ponte Rotto, by daylight on 31 January. In the first day's assault the 7th Infantry had gained about half the distance to Cisterna. before Cisterna, the 3d Division had run into strongly manned and well-prepared positions. Anticipating a renewal of the drive on Highway No. 7, the enemy moved in fresh troops to reinforce the depleted Hermann Goering Panzer Division. Against such resistance the 7th and 15th Infantry had gained over a mile and a half in the first day's attack but were still almost two miles from their goal. During the afternoon and evening of 30 January the 3d Division cleaned up remaining pockets of German resistance behind the forward line, brought up reinforcements and ammunition, and prepared to renew the drive toward Cisterna the next day. With less than two miles separating them from their goal, the 7th and 15th Infantry resumed their attack on the afternoon of 31 January, (Map No. 7.) Instead of driving toward Highway No. 7 north and south of Cisterna they were to advance up the Ponte Rotto and Isola Bella roads to converge on the town itself. This time General Truscott employed the full weight of all his supporting weapons to beat down the German defenses which had held up the previous day's attack. The infantry advance was preceded by successive artillery concentrations. Division and attached artillery fired 1,216 missions (630 of them observed) during 31 January. The Air Force laid a smoke screen behind Cisterna at daylight to conceal the attack, and the 84th Chemical Battalion put down screening white phosphorus fire. Assault guns, tanks, and tank destroyers accompanied the infantry. Although extremely heavy air cooperation was planned, including an attack on Cisterna at H Hour by 70 B-26's, most of the program was canceled because of low clouds. Prior to the attack, on the morning of 31 January, the 4th Rangers cleared out the remaining pockets of German resistance on the road below Isola Bella. They crept forward through the muddy ditches and, aided by two tanks and two assault guns, stormed the last houses blocking the road. By noon the Rangers had forced their way through to link up with the 15th Infantry, which had taken Isola Bella the previous day. In the afternoon, light tanks of Company D, 751st Tank Battalion, assisted the Rangers in rounding up 150 Germans cut off and left isolated in the fields on both sides of the road. On the division right, the 15th Infantry, its line of communication now cleared behind it, attacked on the afternoon of 31 January from Isola Bella. The fresh 2d Battalion passed through the 3d and drove northeast up the Cisterna road. The advance was preceded by massed fires of the 39th and 69th Field Artillery Battalions and the 1st Battalion, 77th Field Artillery Regiment. Knocking out three German tanks and an assault gun, the troops fought their way across the fields toward the white buildings less than two miles away. German resistance was solid. The German defenders clung stubbornly to their intrenched positions before Cisterna. By nightfall the 2d Battalion had gained a mile of the remaining distance to Cisterna, but it was still only half way to its goal. Behind the 2d Battalion the other two battalions of the 15th Infantry cleaned out the German pockets in the fields between Isola Bella and the Cisterna-Littoria road. The 3d Battalion, advancing east along the lateral road from Isola Bella, was strongly counterattacked by seven German tanks driving across the fields from Cisterna. The situation became critical. Three of the four accompanying tank destroyers of Company B, 601st Tank Destroyer Battalion, bad been disabled previously, but Sgt. W. E. Nesmith's M-10, last one of the platoon, baited the threatened enemy breakthrough with well-aimed fire. During the fight he drilled one enemy tank with three shots and the others withdrew. Meanwhile, on the right of the 3d Battalion, the 1st Battalion continued its push northeast to reach the Cisterna-Littoria road. The Germans reacted swiftly. Infantry supported by tanks struck the 1st Battalion in the right flank, knocked out two supporting tank destroyers and a tank, and forced the battalion back 1,000 yards. At the close of 31 January, the 15th Infantry had dug in for the night on its newly established positions. To lead the renewal of the 7th Infantry attack up the Ponte Rotto-Cisterna road, the 1st Battalion, 30th Infantry, was brought up from division reserve. Before it could reach the line of departure at Ponte Rotto, fourteen German tanks, some of them Tigers, attacked down the road from Cisterna. The Sherman tanks and M-10 tank destroyers swung forward to meet the attackers. They caught the enemy tanks in an exposed position along the road, unable to deploy because of the soggy fields and ditches on both sides. In the ensuing tank battle, Shermans of the 751st Tank Battalion knocked out three of the enemy tanks; a platoon of the 601st Tank Destroyer Battalion shot up two more. The infantry called for artillery fire from the 9th Field Artillery Battalion. The Germans hurriedly withdrew. Then, behind massed fires laid down by the 9th, 10th, and 41st Field Artillery Battalions, the 1st Battalion, led by Maj. Oliver G. Kenny, attacked up the road at 1620 and advanced a quarter of a mile beyond the creek before darkness forced it to dig in. On the extreme left of the 3d Division attack, the 1st Battalion, 7th Infantry, which had reorganized during 30 January, again tried to cross the railroad northwest of Cisterna and cut Highway No. 7. Major Sinsel employed his armor and heavy mortars to clean out the farmhouses and haystacks from which enemy machine guns were holding up the battalion. Against slight opposition he then pushed forward toward the railroad line. En route, the battalion surprised and overran a group of 150 Germans, who evidently had no idea American troops had penetrated so far, for they were not even dug in to meet the attack. When the battalion reached the railroad line, the situation changed. Here they were halted by dense, interlocking bands of fire from what was evidently the enemy's main line of resistance. The bridge over the railroad had been blown, preventing tanks from getting across to clean out the enemy. Under cover of the accompanying tanks and tank destroyers, whose fire drove the Germans to shelter, Major Sinsel withdrew his battalion south about 400 yards to a reverse slope and dug in for all-around defense, All night and the next day (1 February) the Germans showered the exposed salient with artillery and mortar fire and tried to infiltrate machine guns to the battalion's flanks. Each time they heard the Germans moving in, four or five men would sneak up and knock out the enemy machine-gun crew. At 1930 the battalion drove off a counterattack on the left rear and captured two enemy machine guns. Although they had almost exhausted their ammunition and were out of contact with the other rifle companies, Major Sinsel and one hundred of his men held their positions. A strong patrol from the 2d Battalion, 7th Infantry, was hastily moved up that night to plug the gap between the 1st Battalion and Company G, 30th Infantry, and to mop up enemy snipers to their rear; it returned without having made contact with Company G.
The night of 31 January, ending the second day of the attack on Cisterns, found the 3d Division battling stubbornly forward but still unable to break through. Many fresh German units, especially mobile reconnaissance battalions, which were usually the first elements of a new division to arrive, had been committed on 31 January to reinforce the Hermann Goering Panzer Division. The enemy's sharply increased use of massed armor was made possible by the arrival of the bulk of the 26th Panzer Division from the Adriatic front. held back the Germans long enough for the two advance companies of the battalion to withdraw and reorganize. With machine-gun bullets, grenades, and 20-mm. flakwagon shells bursting around him, he first knocked out a German machine gun, killing two and wounding another of the crew. As he did so, two Germans crept up and threw grenades within ten feet of him. Private Knappenberger killed both Germans with a burst of fire. Remaining in an exposed position throughout the action, he dispersed an entire enemy platoon. Only when his ammunition was gone did he rejoin his company 300 yards to the rear. The 1st Battalion remained near Pantano ditch where it had been stopped in its drive. General Truscott considered it essential to protect the division right flank before any resumption of the attack on Cisterna. Accordingly, he ordered the 15th Infantry to continue its advance toward the Cisterna-Littoria road in order to block any possible enemy counterattack across Cisterna Creek. On the morning of 1 February the 1st Battalion attacked for the third time in an effort to reach the road. For the third time it failed. The troops were unable to break through the Hermann Goering Panzer Division barricaded in the houses barring the way. By noon it was clear that the 3d Division, holding a wide front and exhausted by three days of bitter fighting, could Dot hope to take Cisterna in the face of the ever increasing build-up of enemy troops. In fact, the German concentration opposite the 3d Division, and, in particular, the appearance of the 26th Panzer Division, the enemy's chief mobile reserve, forecast an early German counterattack. General Truscott pulled back the 1st Battalion, 30th Infantry, from its exposed position to the stream line at Ponte Rotto and ordered all troops to dig in immediately to meet the expected attack. entire German battalion, capturing 131 prisoners in the subsequent mop-up. The 7th Infantry still held firm. On the afternoon of 1 February the 3d Division attack toward Cisterna had lost its momentum. In three days the division had gained two to three miles up the roads leading to Cisterna, but had been unable to break through the last 1,500 yards to seize the town. The division had fought on approximately a 7-mile front toward an objective three to four miles away. An attack on such a wide front by a limited force could be expected to succeed only against relatively weak enemy opposition. But the opposition was not weak. The Germans succeeded in building up their strength and establishing a defensive system around Cisterna in time to stem the attack. Instead of meeting mobile covering forces, 3d Division troops struck well-organized and strongly dug-in positions amply supported by artillery and armor. In spite of these obstacles, the division almost reached Cisterna, and, although it suffered heavy losses, it had also inflicted heavy losses on the Germans. By the evening of 1 February, however, the tide had turned; the enemy now had numerical superiority. Forced to assume the defensive, the 3d Division began hastily digging in behind a barrier of mines, wire, and antitank guns to hold its gains and meet the expected enemy counterthrust. An uneasy lull settled over the division front as Americans and Germans prepared for the fight to come. While General Truscott on the right drove on Cisterna, VI Corps made its main effort toward Colli Laziali along the Albano road. From the British positions above Carroceto this dominating hill mass was clearly visible. General Lucas' plan called for the British 1 Division to breach the enemy's main line of resistance along the railroad by seizing the crossing at Campoleone. The 1st Armored Division was to swing wide around to the left of the Albano road to assault Colli Laziali from the west while the British continued their attack up the main road to seize the high ground on the south slope. The plan of General Penney, commanding the 1 Division, was to pass the fresh 3 Brigade through the 24 Guards Brigade to seize Campoleone. At 2300, 29 January, the 1 Scots Guards and the 1 Irish Guards attacked to secure the crossroads 2,000 yards south of the Campoleone overpass as a line of departure for the main attack. (Map No. 5.) The 1 Scots Guards on the right struck a mined and wired-in road block south of its objective but pushed through with heavy losses. On the left of the road, however, the 1 Irish Guards were forced back at dawn by enemy tanks and self-propelled guns. To meet the threat of enemy armor the 3d Battalion, 1st Armored Regiment, was hastily withdrawn from the 1st Armored Division attack and sent to assist the British. American and British tanks and tank destroyers drove off the enemy armor, and the infantry was able to restore its forward positions. The defending 29th Panzer Grenadier Regiment was severely handled in this action. The sharp fighting for the line of departure delayed the 3 Brigade attack until 1510, 30 January. (Map No. 6.) At this time the 1 Battalion, King's Shropshire Light Infantry (1 KSLI), and 1 Battalion, Duke of Wellington's Regiment (1 DWR), drove forward against scattered opposition and seized their objective on the high ground just south of the overpass at Campoleone. Tanks of the 46 Royal Tanks hotly engaged enemy antitank guns beyond the railway embankment but were unable to cross. Since it was now too dark to continue the attack across the railroad, further advance by the 1 Division was postponed until the next day. advance across the gullies and, once gained, it could be used as a line of departure for a drive northeast along the more favorable ground of the ridges lying between the gullies. General Harmon assigned the task of clearing the area along the old railroad bed to Col. Kent C. Lambert, commander of Combat Command A. Colonel Lambert prepared to make a reconnaissance in force, employing Company B, 8 1st Reconnaissance Battalion, Companies A and I, 1st Armored Regiment, the 1st Battalion, 6th Armored Infantry, and the 91st Armored Field Artillery Battalion. This force was dispatched on the afternoon of 29 January. (Map No. 5.) In order not to interfere with priority traffic on the main Albano road, the column turned off at the first overpass and followed a track leading north to Buonriposo Ridge. The Germans were not believed to have more than small delaying forces in this area. As the leading armored cars nosed onto the ridge, they were met by sniper and machine-gun fire from enemy positions on the upper side of the Moletta River gully. Unable to cross the deep ravine, the tanks and armored cars skirted the south bank up to the railway bed, where they were halted by a mine field and by intense enemy fire. Colonel Lambert withdrew his force out of range to regroup. No sooner had the tanks halted than they bogged down in the muddy ground. Colonel Lambert decided to hold up for the night short of the railroad bed and secure the line of departure in the morning after his tanks had been dug out and suitable reconnaissance had been made. The remainder of the 1st Armored Regiment and the 6th Armored Infantry (less the 2d Battalion, still on the southern front) moved up under cover of night to reinforce Combat Command A. (Map No. 6.) The 3d Battalion, 504th Parachute Infantry, and the 894th Tank Destroyer Battalion were attached as division reserve. Once the tanks were freed the following morning, five tank companies moved out across the upper Moletta gully and engaged the enemy along the next ridge. Many of the tanks, however, bogged down again, and the heavy smoke and artillery fire on a cold, cloudy day made it difficult for the tankers to see. Since the armor was unable to get beyond the gravel road along the ridge, General Harmon ordered the 6th Armored Infantry under Col. Paul Steele to attack with the tanks astride the railway bed and clear out enemy resistance to the next stream line. Careful plans were worked out for tank-infantry cooperation to reduce each enemy strong point. These plans had to be partly canceled when a tank battalion (3d Battalion, 1st Armored Regiment) was withdrawn just before the attack and sent north to assist the British. Lack of this tank support hampered the assault of the 6th Armored Infantry. The infantry pushed forward that afternoon through a wall of mortar and machinegun fire and reached the gravel road along the ridge. Here they were held until dark by a 400-yard hasty mine field, well covered by antitank guns, laid at the intersection of road and railway bed. By the end of the first day of the attack along the Albano road the 1st Armored Division was still struggling for its line of departure, and the British, while scoring a 2-mile advance, had still to breach the enemy defenses at Campoleone. 1. Minus the 3d Battalion but with the 3d Battalion, 504th Parachute Infantry, and 27th Armored Field Artillery Battalion attached. with a tank battalion in support (3d Battalion, 1st Armored Regiment), was to continue its attack at dawn to seize the two and one-half miles along the railway bed designated as the line of departure in the original order, and then prepare to attack north. At 1030, 31 January, the 2 Battalion, Sherwood Foresters (2 Foresters), and tanks of the 46 Royal Tanks attacked from their positions south of the overpass at Campoleone with the objective of seizing the crossroads at Osteriaccia and breaching the enemy line of resistance along the railroad embankment at Campoleone to allow the armor to pass through. (Map No. 7.) They fought their way across the embankment but then ran into a hornet's nest of resistance from part of the 29th Panzer Grenadier Regiment firmly intrenched in the houses lining the road from Campoleone to Osteriaccia. Tanks and self-propelled guns covered every avenue of approach. Some of them had been driven through the backs of buildings and were firing out the windows. A mine field barred progress up the road. Brig. J. R. James, commanding the 3 Brigade, withdrew his infantry in order to allow tanks and artillery to soften up German defenses. In preparation for the armored assault, General Harmon had ordered Maj. William R. Tuck to employ his 1st Battalion, 1st Armored Regiment, to reconnoiter the more level ground west of the Albano road near Campoleone for suitable stream crossings and routes across the railroad embankment. On the morning of 31 January, the tank column had swung up the road behind the British positions, and then had turned off and fanned out over the rise south of Campo del Fico Creek. Overrunning enemy machine gunners, they drove the Germans from the ridge. Enemy infantry counterattacked but were shot down by the tanks' machine guns. The estimated killed numbered 175. 1st Lt. Olin Dyer's platoon of Company C skirted the next gully until it found a crossing and then charged up the ridge on the far side while the Germans broke and fled. The platoon overran three mortar positions and a 75-mm. antitank gun. An enemy self-propelled gun set fire to Lieutenant Dyer's tank, but was in turn set aflame by another of his platoon. Two Mark IV's were put out of action by gunner Everett B. Perrien, using a 37-mm. gun. Having driven off the enemy tanks, the light tanks moved forward to the railroad, but were stopped by enemy antitank guns and heavy weapons along the railroad embankment. Intense enemy artillery fire throughout the action was largely ineffective because of the high percentage of air burst, which rattled off the buttoned-up tanks. Unable to force their way across the embankment before dark, the American tanks withdrew. As a prelude to a renewed British attack on the afternoon of 31 January, the 2d Battalion, 1st Armored Regiment, launched a raid up the Albano road toward Campoleone. The medium tanks reached the railroad embankment and fired heavily on the fortified houses beyond at about a 700-yard range but were unable to cross because of severe enemy fire. After a massed artillery preparation by the 1 Division artillery, the 2 Foresters attacked again, but were turned back by heavy small-arms, mortar, and self-propelled gun fire from enemy positions some 300 yards beyond the railway. The effort of the 1st Armored and 1 Divisions to break through along the Albano road had not succeeded. While the drive on Campoleone was in progress, the 6th Armored Infantry had resumed its attack along the old railroad bed northwest of Carroceto at dawn on 31 January. The battalion met heavy machine-gun fire from Germans intrenched in farmhouses across its line of advance. Essential tank support to knock out these German strong points was delayed in coming up; and the mine fields, barring the way up the railroad bed, proved to be well covered by German antitank guns which Allied artillery was unable to knock out. Against strong opposition and unusually heavy German artillery fire, the troops were able to gain only 500 yards. By evening, Colonel Steele reported that a further advance would be extremely difficult. His flanks were unprotected and his center was held up where the mine field had not been cleared. General Harmon halted the attack and the 6th Armored Infantry and its supporting tanks were relieved by the 24 Brigade that night. VI Corps withdrew the 1st Armored Division back into Corps reserve. and penetrated the German main line of resistance west of the Albano road, where a 2-mile gap was opened between the 65th Infantry Division on the west and the 3d Panzer Grenadier Division holding the center of the German line east of Campoleone. Despite this Allied penetration along the Albano road which became known as the Campoleone salient, by 1 February the VI Corps attack to secure Cisterna and Campoleone bad spent itself against unexpectedly strong German defenses. Reconnaissance reports before the offensive had indicated that the Germans held only delaying positions before Cisterna and Campoleone, and that their main line of resistance lay back on the high ground of Colli Laziali and the Lepini Mountains. Instead, the Germans determined to make their stand before Cisterna and Campoleone, key points on the two main axes of attack inland. The enemy had not only succeeded in rushing up reinforcements in wholly unexpected strength, but had also built up a strong system of defenses barring the approaches to Cisterna and Campoleone. Every house and village was converted into a strong point and these were connected by well-camouflaged machine-gun nests and rifle pits. Tanks and roving self-propelled guns and massed artillery and nebelwerfer fire supported these positions. Allied troops again found, as they had all through the Italian campaign, the excellent fortification value of the heavy stone construction of Italian farmhouses. Reducing each house was in fact a small separate operation, requiring tanks and tank destroyers to demolish the building before the infantry could move in. Sniping and infiltration by small enemy groups continued long after key defense points were seized, and the infantry continually had to mop up bypassed pockets of Germans who fired on them from the rear. Every advantage of terrain, too, lay with the enemy. On the left flank the armor found it difficult to penetrate the natural obstacles presented by rough stream gullies and ground made soggy by repeated rains. On the right flank the route of advance lay over open, muddy fields offering scant cover for the attacker while providing excellent fields of fire for defending troops. January rains made ground movement difficult, and low clouds during the crucial period of the attack severely hampered the air effort. In the face of such a combination of obstacles, Allied troops had driven fourteen miles inland from Anzio to within five miles of Colli Laziali, but they lacked the strength to break through at Cisterna and Campoleone. After a conference with General Clark on 1 February, General Alexander ordered VI Corps to continue the attack to extend the beachhead to the Incastro River-Campoleone-Cisterna line, and then organize for defense. 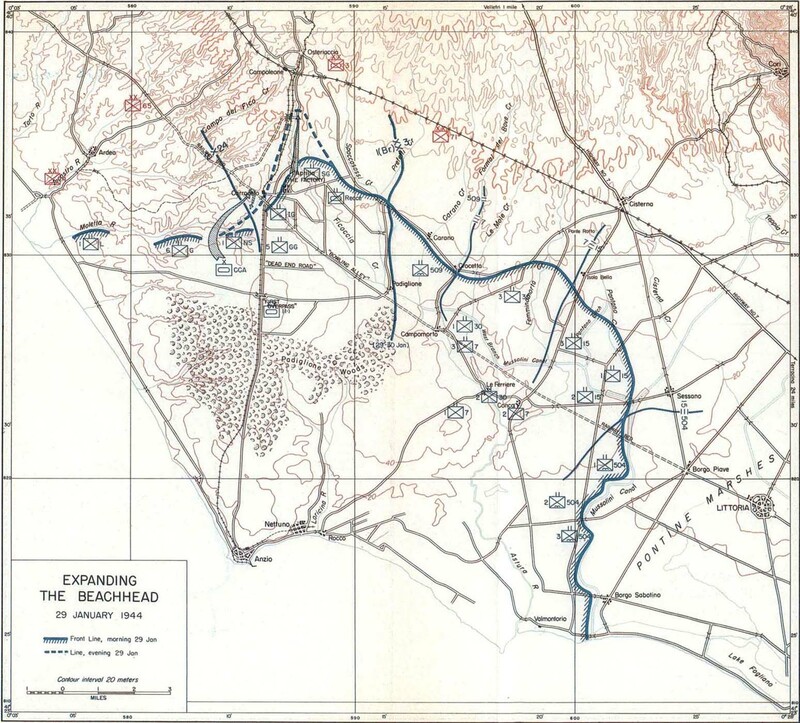 The initial beachhead bad been the largest that could be held with the limited number of troops originally landed, but it was so small that any part could be reached by enemy artillery and there was little room for maneuver or defense in depth. A breakthrough at any point would bring the Germans almost to the sea. Consequently General Alexander desired to extend the beachhead farther inland and anchor it on the key points of Cisterna and Campoleone. By the afternoon of 1 February, however, it was evident that these objectives could not immediately be attained. The enemy build-up had become so threatening that VI Corps ordered all divisions to organize to repel a counterattack. 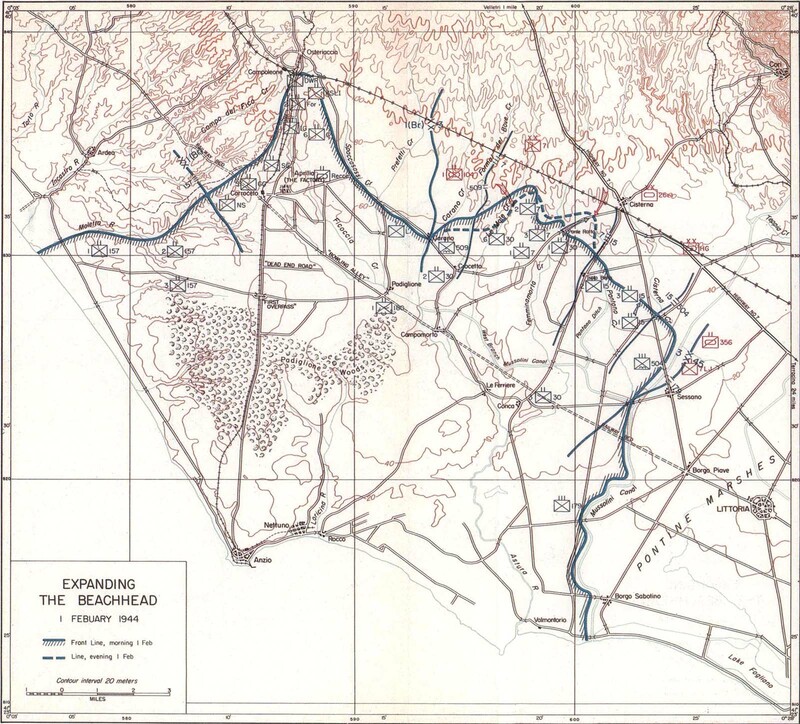 On 2 February, General Clark radioed General Lucas to consolidate the beachhead and prepare for defense. General Lucas on 3 February gave verbal orders to the units of VI Corps to assume the defensive. All units began immediate preparations of defensive positions to meet the expected German assault. VI Corps had increased to nearly 100,000, including service troops. Although inferior to the enemy in numbers of troops,2 it was better equipped and supplied-particularly in guns and ammunition-than the opposing German forces. While the Allied offensive of 30 January-1 February made only one important penetration, the German Fourteenth Army was forced to commit the bulk of its combat forces to stem the VI Corps advance. In fact, Allied armor came very close to effecting a breakthrough at Campoleone Station on 31 January. For the time being, Fourteenth Army had to postpone a large-scale counterattack designed to wipe out the Allied beachhead, and to limit its immediate mission to defense-preventing the Allied troops from expanding their beachhead and inflicting on them as heavy losses as possible, On 1 February Fourteenth Army for the first time expressed doubt that it had sufficient strength to eliminate the Anzio beachhead. The German losses in the fighting of 30-31 January were heavy. Allied bombings of railroad lines were delaying the arrival of reserves; more importantly, they were preventing the Germans from receiving an adequate supply of ammunition. Nevertheless, Fourteenth Army was ordered to hold assault troops in readiness to launch a counteroffensive at the first opportune moment. 2. It is estimated that Fourteenth Army numbered about 110,000 at this time. effort in the bulge north of the Factory, but this did not materialize. The Germans themselves counterattacked strongly west of Cisterna at dawn on 1 February with the 71st Infantry Division and the Hermann Goering Panzer Division. But German attempts on 1-2 February to recover their former forward positions in front of their main line of resistance were repulsed. 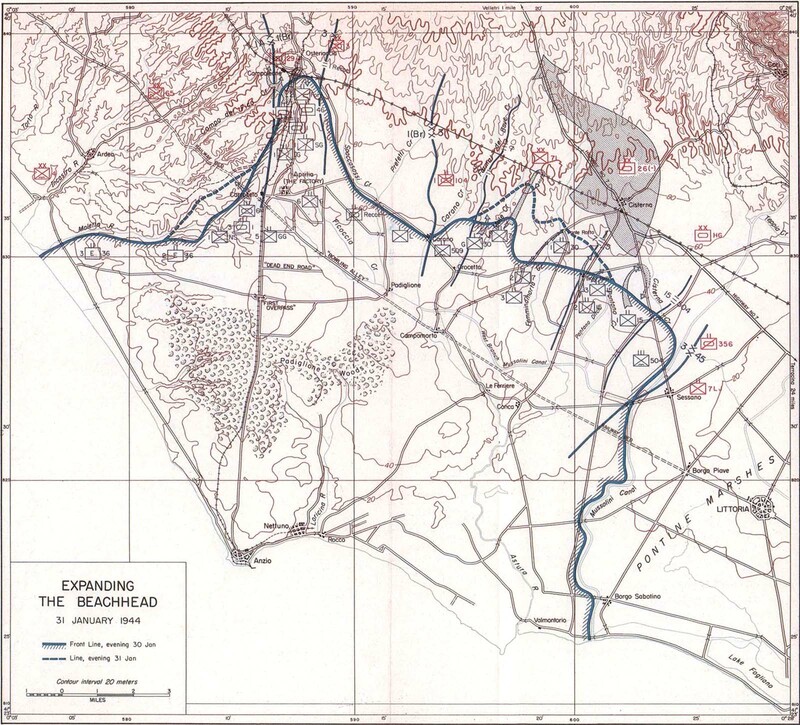 In effect, VI Corps in its offensive had advanced its positions up to the German main line of resistance along the whole beachhead perimeter, and penetrated it in the bulge up the Anzio-Albano road. On 2 February the Germans were also forced to draw back their main line of resistance in the 71st Infantry Division sector north of Carano; this division had suffered heavy losses and had to shorten its front in order to strengthen its position. As soon as VI Corps halted its offensive after three days of heavy fighting, Fourteenth Army renewed preparations for a major counterattack. The weight and accuracy of Allied artillery fire delayed this attack. The Germans attributed the partial failure of the counterattack launched by the Hermann Goering Panzer Division on 1-2 February to the demoralizing effect of Allied artillery fire. On 2 February, the artillery communications net of Combat Group Graeser was totally destroyed; the loss of fire direction charts forced a 24-hour postponement of the counterattack on the bulge north of the Factory. On 2 February also, Army Group C ordered the transfer of troops to meet the threatened invasion at Civitavecchia, and announced its intention of transferring some troops from Fourteenth Army to bolster the Cassino front. Such factors were to limit the German counterattack on 3 February to a preliminary drive against the bulge north of the Factory, and require a postponement of the major German counteroffensive to 16 February. The projected main Fifth Army drive against Cassino and the strongly defended mountain mass to its rear was launched on 1 February. During the first week of February the troops of II Corps penetrated the mountain defenses of the Gustav Line and fought into Cassino itself. But they could not break through the final German positions and reach the Liri Valley. 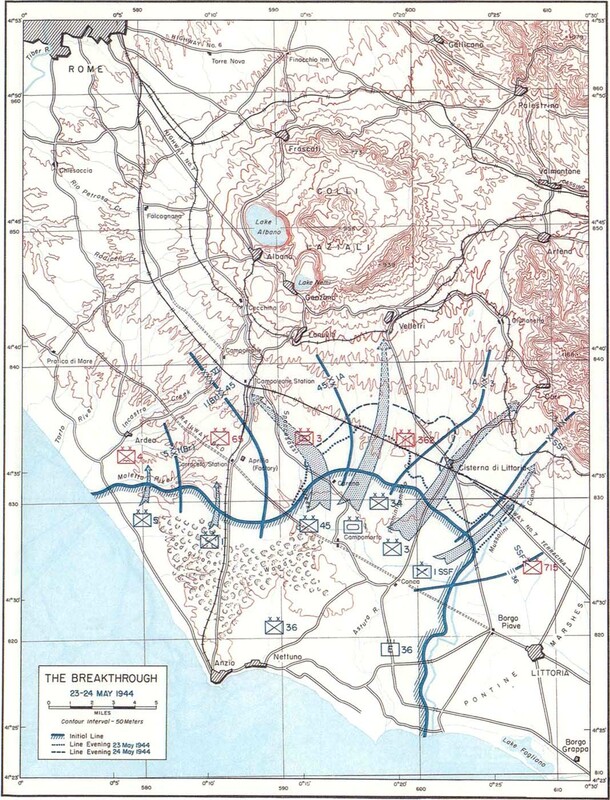 After 7 February, despite successive assaults during the remainder of the month by American, New Zealand, and Indian troops, there was but slight forward progress in the Cassino drive; at the end of the month, a virtual stalemate had developed. Elsewhere on the Fifth and Eighth Army fronts, bad weather, and a decision to await the outcome of the critical action at Cassino, led to a postponement of all large-scale offensive operations after the beginning of February. Thus the projected plan to coordinate a drive out of the Anzio beachhead with an advance on the southern front came to naught. During the critical days of the Anzio campaign in mid-February, operations on the southern front, except at Cassino, were at a standstill. Because of this stalemate in the south, the enemy was able to hold the Fifth and Eighth Armies at bay with fewer troops than he assembled before Anzio in an all-out effort to drive VI Corps from its beachhead.